This title of “hortus conclusus” attributed to Mary appears in medieval and renaissance poetry. The title stems from the Canticle of Canticles (cf. 4:12): “Hortus conclusus soror mea, sponsa, hortus conclusus, fons signatus” – “A garden enclosed is my sister, my spouse; a garden enclosed, a fountain sealed up.”As early as 1330, it can be found in manuscript illuminations where the depicted garden is usually enclosed or has a relatively small entrance or a barred gate. One of Fra Angelicos earlier frescos, the “Annunciation”, in the convent San Marco, Florence, is usually dated to 1430. In this marvelous representation, this Renaissance painter and Dominican friar depicts a recollected Mary, seated on a wooden stool in an open portico with walls behind and arches above her. The background is divided into the back wall of the edifice and a garden with a rather high picketed fence. In the garden opulent trees of different sorts are growing. Very early on, the Virgin Mary took on titles expressing the particular graces attached to her as well as the dogmas promulgated about her, such as “Mother of God,” “perpetual virgin,” “Queen of Heaven”. The curious title of “enclosed garden” makes sense when one keeps in mind that it had always been part of the sensu fidei that the Mother of God was without sin, i.e. personal sin as well as original sin. Well before the dogma was defined in 1854 by Pope Pius IX, the faithful believed that Mary was the new “man”, or better the new “Eve”, created according to the creator’s original design. The enclosed garden is a poignant symbol: it shows the fruitfulness of spring – much like the fruitfulness of the virgin’s womb which brought forth Jesus Christ – as well as her untouched nature, exemplified in the gated fence. No unwelcome visitors are allowed here, the garden is an oasis only for our Lord. The garden of her soul has never been sullied by the serpent whose head she crushes. Yet another peculiar detail strikes the viewer: the order of the colonnades. Those horizontally set and closest to the viewer are Corinthian, yet the ones reaching into the painting away from the viewer are Ionic — two of the three classic kinds. Vitruvius teaches that the Ionic order is inspired by the “slenderness” of the female body and therefore represents womanhood. The Corinthian kind of column – visible in the foreground – is usually linked with enduring or everlasting life, as well as with the resurrection. Hence the resurrection of Christ is already foreshadowed in the Annunciation. 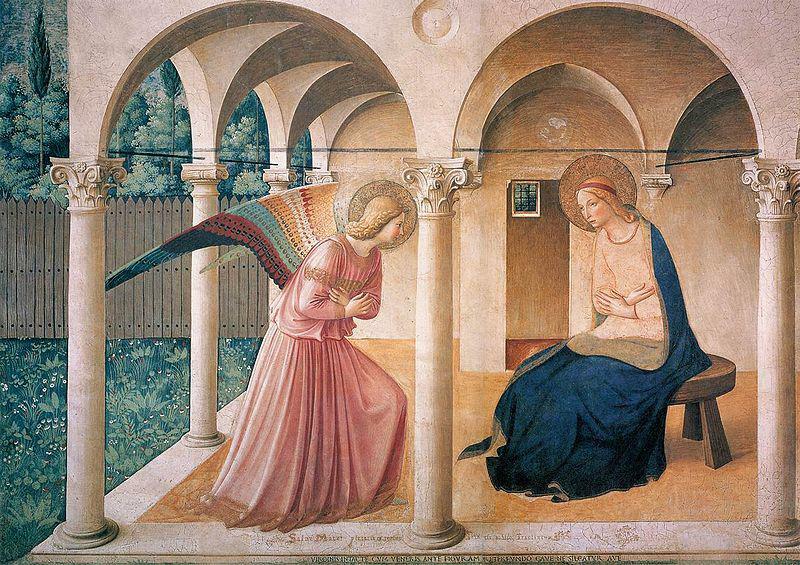 By including both Ionic – feminine, virginity – and Corinthian columns – Christ, motherhood – Fra Angelico offers his viewers another insight into Mary: that of being fully virgin and fully mother of God. In his depiction, Fra Angelico invites us to contemplate these mysterious – seemingly contradictory – features of the Mother of God, that we may grow in love towards her.